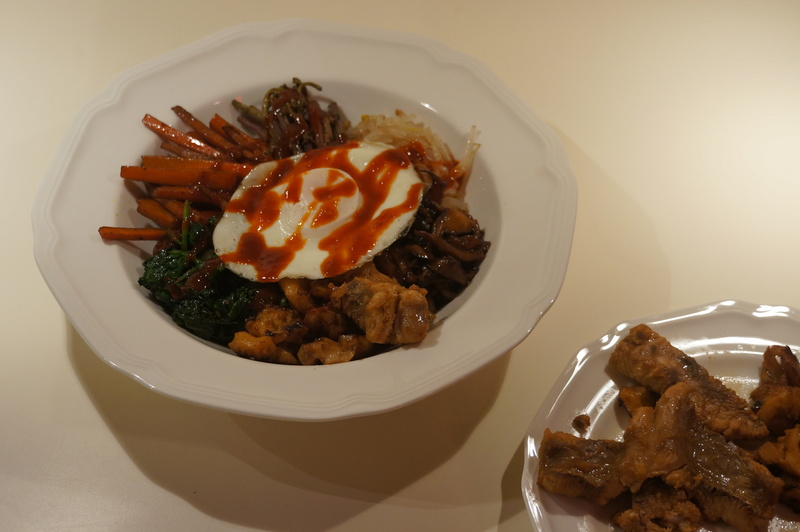 Bibimbap is a Korean rice dish with a mix of vegetables and sometimes meat. The vegetables are each cooked and seasoned separately, but the same wok can be reused for each step, keeping dishes to a minimum. Tongs seemed to work the best to prevent the vegetables from burning and also made it easy to transfer the finished items to a serving platter. Many different types of protein can be used with this recipe. We used spicy tofu on one of the bowls and marinated shark and conch on the other bowl. Both of them turned out well. This is the first time I’ve used fernbrake and I wasn’t a huge fan. 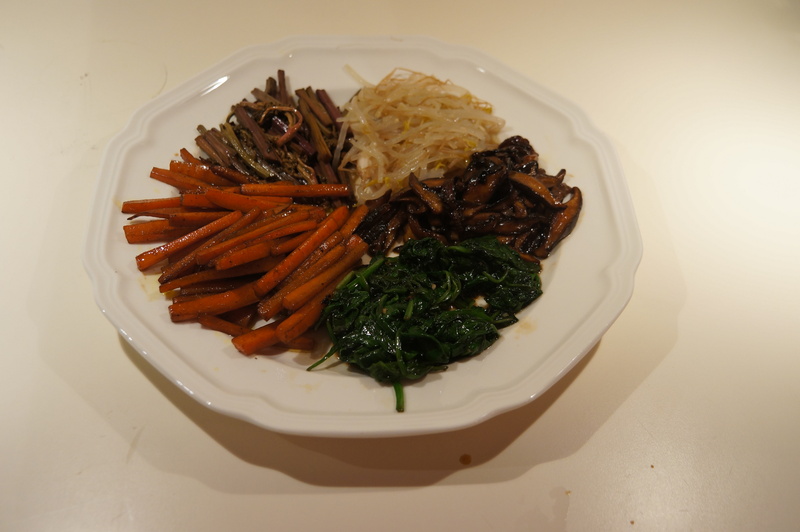 Next time, I would swap it out for zucchini instead and also increase the amount of mushrooms. This would work well when a quick dinner is needed or if there were a variety of veggies that needed to be used up. Prep vegetables and arrange on a platter or large plate. Rinse bean sprouts 3 times then put in a pot and cover with water. Add 1 tsp salt and cook on medium heat for 20 minutes. Drain sprouts and mix in 1 clove garlic, 1 tsp sesame oil, and a pinch of salt. Heat 1 tsp vegetable oil in a wok on medium high heat. Add the fernbrake and saute for 2 minutes. Add 1/2 Tbsp soy sauce and 1/2 Tbsp sugar; continue to cook for 2 minutes longer. Stir in 1 tsp sesame oil. Return fernbrake to platter. Add 1 tsp vegetable oil to the wok and saute mushrooms for approximately 2 minutes, until browned. Stir in 1 tsp soy sauce and 1 tsp sugar and continue to cook for 1 minute. Mix in 1 tsp sesame oil. Return mushrooms to platter. Add 1 tsp vegetable oil and carrots to the wok. Saute for 1 minute or until slightly softened. Return carrots to platter. Add spinach to the wok and cook until wilted. Mix in a pinch of salt, 1 tsp soy sauce, 1 clove garlic, and 1 tsp sesame oil. Return spinach to platter. Cook eggs to over-medium (whites set, yolk to a gelled consistency). In a wide bowl, place 1 cup of rice. Arrange half of vegetables on top, plus meat/tofu if having. Top with 1 egg. Drizzle with gochujang or sriracha and serve. This entry was posted in Entrees and tagged fish, Korean, rice, sprouts, tofu, vegetables. Bookmark the permalink. An online recipe box to keep straight the recipe changes and compilations that make up my cooking and baking.